A Ravenloft adventure for characters of 5th level and higher. 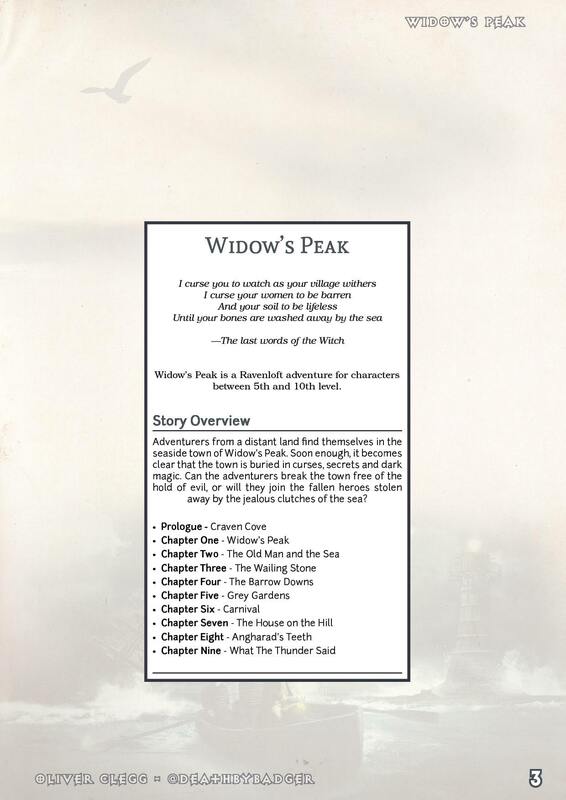 Adventurers from a distant land find themselves in the seaside town of Widow’s Peak. Soon enough, it becomes clear that the town is buried in curses, secrets and dark magic. 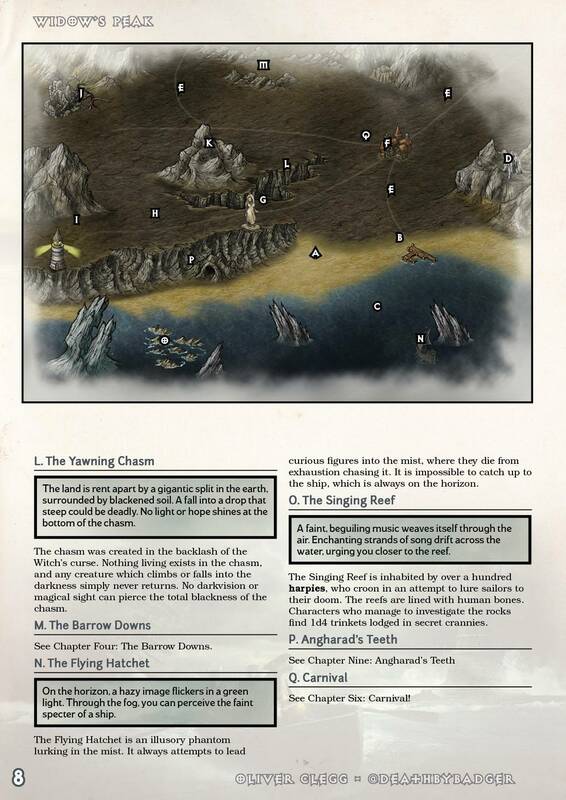 Can the adventurers break the town free of the hold of evil, or will they join the fallen heroes stolen away by the jealous clutches of the sea? An introduction to Craven Cove, a Ravenloft domain filled with hideous curses, salty regret and murderous gulls, including Life In Craven Cove, Corruption Stew and the Marks of Horror that set Craven Cove apart. Guidance on Curses in Craven Cove, with a table of petty hexes perfect for a jaunt to the seaside. Craven Cove's random encounter tables, day & night. An Craven Wild Magic table, and assorted flotsam and jetsam in magic items or trinkets. The first installment, Widow's Peak, in which the Walrus takes you for a stroll. The second installment, The Old Man and the Sea, where the the light may blind you or save you. The third installment, The Wailing Stone, where misery shared is a burden tripled. The fourth installment, The Barrow Downs, where the weather develops a taste for blood. The fifth installment, Grey Gardens, where stone dreams are made of you. The sixth installment, Carnival in which the barker has a bite. The seventh installment, The House on the Hill, where flesh falls to dust. The eighth installment, Angharard's Teeth, where blood hits the water. The ninth installment, What The Thunder Said, where a simple choice has a lasting consequence. 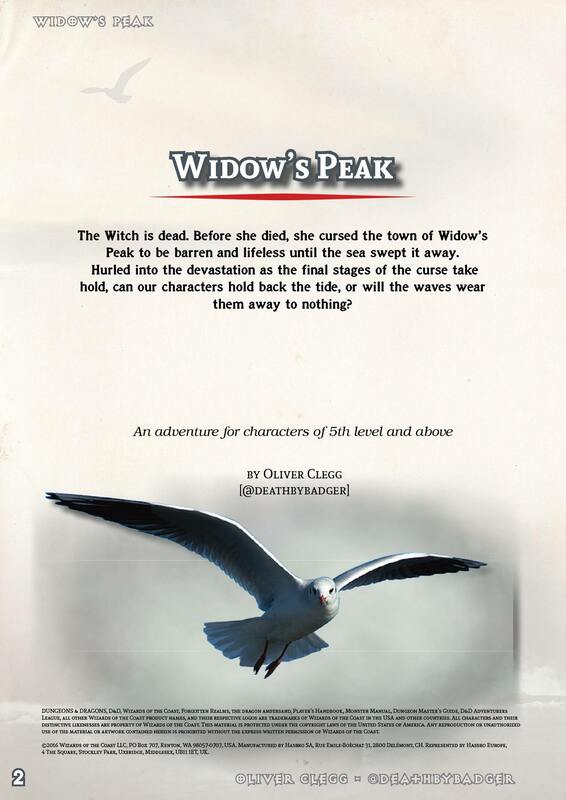 “WIDOW’S PEAK” BREATHES FRESH SALTY SEA AIR INTO THE GENRE" - RogueWatson.com - read the full review here. "Overall, evocative and strong writing elevate Widow’s Peak above other adventures." - Merric's Musings - read the full review here. "THE GULLS. I HEAR THEM SCREAMING. NO MORE." - Levo the Brave. "Ok, so I have to jump up and down how many times? I hate curses." - Samwise the Unready. "On consideration, maybe having a hook for a hand isn't that bad." - Bognab the Bard. THE MOTHER HAGGLE OMNIBUS [Copper Bestseller] - Over 80 pages of tragic tasks, from rescuing a cow to facing down a dangerous archdevil. Prepare yourself for deadly struggles completing seemingly easy tasks, until you die in a horribly ignoble manner. As you grow in her estimations, prepare to deal with her vast array of petty squabbles, from murdering a tribe of goblins to facing down a gigantic infernal peacock. THE CITY OF EYES [Copper Bestseller] - Escape is unlikely. Enjoyment fleeting. I implore you, turn away and don't look back. Illusion, mystery and madness await, and wriggling death is a mercy afforded to few visitors in the City of Eyes. SOLACE IN SILENCE - The mists of Ravenloft ebb and flow, stealing away heroes and bringing them face to face with ancient evils. In some worlds, however, the fight is already lost. Enter Solace, a world devastated by an alien infection, and prepare yourself to make a simple choice. Enter Solace, a world buried in snow, and witness the work of evil run amok. Enter Solace, and answer a simple question - when the world is quiet, and no one is watching, who do I choose to be? I plan on running this soon, but I feel like it needs an introductory adventure to set the mood for players, kind of like what Death House did for Curse of Strahd. Do you have any suggestions as to how I might try to do this? How long does it take to run through this? I'm afraid to say (rather unhelpfully) that this can vary due to the structure of the module. It's likely to take significantly more than one sitting, though, depending on how much your players like to explore. A speed run could be done in an afternoon. A slower run could easily take 10+ hours. I am about to run this, but in a time loop sort of way. I need a dream sequence to take place when I only have half the party (I usually run with 8!) and I think this would be a Life is Strange sort of puzzle for my characters to figure out! Well, they scored a point of corruption for the lighthouse...situation... Hahaha. Next stop, the gardens! I think Ill twist the medusa into being the cursed love of the giant.... Id also encourage DMs running the game to try to incorporate the witch into a player backstory. You leave it open enough that the Witch could be someone thought lost to the player... making it a bit of a tragedy or leaving it open for something else entirely.